“Masters of the Universe” is one of the most-watched movies of my life – due to the fact that it was one of the very few films that we had at home on VHS (taped from TV). Since we only had two channels (the two austrian national television channels) when I grew up, and they never showed “Star Wars” there (and we didn’t have any purchased VHS-tapes), “Masters of the Universe” (together with “Spaceballs”, which I adore to this day) was my substitute drug. I absolutely loved it as a child (the fact that I never was that much into “He-Man”, thus not even noticing that it didn’t really have that much to do with the animated show and/or audio dramas, might have helped with that). A couple of years back, when the Blu-Ray came out, I decided to give it another go (after like 20 years), and as you can imagine, it was a rather disillusioning affair. I was still able to enjoy it because of its trashy charm, but I couldn’t help noticing all those errors and problems that just don’t register when you are a child. Nevertheless, when they announced a retro-screening of “Masters of the Universe” for this years /slash Filmfestival, I knew that I had to be there. Before we get to the movie itself, a short rant: I don’t get the obsession with some parts of film culture with 35mm. Don’t get me wrong, if the copy is in incredibly good shape, or if a movie might not be available otherwise, I understand it if you do a 35mm screening. Otherwise, it’s “digital cinema FTW” for me – and this screening of “Masters of the Universe” unfortunately affirmed me in that. The 35mm print was in rather bad shape, with lots of grain and noise in the picture, some reels had a very noticeable purple tint to them, and to top it all off, we had three film tears, which totally disrupted the flow of the movie. Seriously, if the movie would have stopped one more time afterwards, I would have stood up and left. Why not simply get the permission to show it and grab a Blu-Ray? Hell, I would have lended them mine free of charge! I’m pretty sure shipping the 35mm print over from London wasn’t cheap, and in this case, it just wasn’t worth it. Personally, if it’s not something that I absolutely have to see and there’s no chance to see it any other way, I’m done with 35mm. I actually think it’s insulting to the filmmakers which poured a lot of time and effort into the movie, and whose work – sets, cinematography, costumes etc. – you can’t really appreciate anymore on a crappy print. In my very humble opinion, this 35mm-obsession is one form of cinematic nostalgia that we very well could do without. Rant over, let’s get back to the movie. I have to say that this time, forewarned of what would await me, I liked it a little better than I did three years ago, when my child- and my adult-self fought quite bitterly within me (“Two souls, alas, are dwelling in my breast.”), and where my expectations were tainted by nostalgia. Now I pretty much knew what I was getting into, including the sometimes blatant plagiarism of “Star Wars” (Skeletor feels like a blend of Darth Vader and the Emperor, throws force-lightning-similar beams unto He-Man, and his demise is practically identical to Palpatine’s; Gwindor is reminiscent of Yoda; and the stormtroopers got a new paint job and are now black), the rather slow and weak middle part, the overall trashyness of it all, and that extremely kitschy ending that actually kinda ruins the entire movie when you realize that the cosmic key is able to bring someone back in time (which raises the question why they didn’t already do that in the beginning). This time, it didn’t really matter, though. The audience I saw it with definitely also had an influence on that. This is just one of those movies that you have to watch with an enthusiastic audience who cheer and laugh and clap – even (or especially) on the more silly parts. Other things I already appreciated three years back, and again did so now: The great costumes, the lavish sets, the overall effects work, the great Skeletor-mask, Frank Langella’s incredibly charismatic performance, and Bill Conti’s grandiose (in every sense of the word) score, which is one of my all-time favorites (and which I’m listening to right now while writing this). There also is an undeniably charm to it all. It’s very good-natured, has a couple of truly funny moments, and even though they might ultimately fail here and there, you can at least see that they tried, and really put a lot of effort into the entire film. My favorite part of it, however, is the last act. The rest of the movie might require a moderate trash-tolerance-level, but the last thirty minutes of so (after He-Man’s capture) are absolutely great. There’s a lot of tension, things look incredibly dire, by then I really felt a connection to all of the characters, and the final showdown in Greyskull is incredibly well shot. 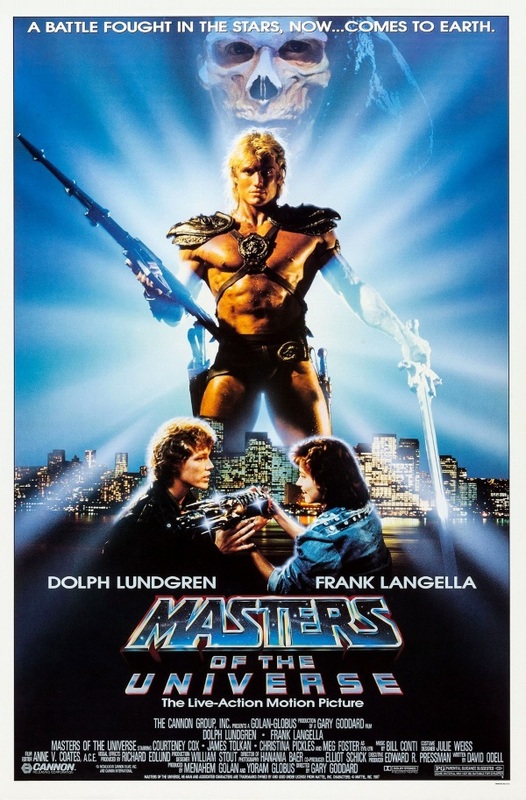 Overall, after the rather sobering experience of watching this for the first time after 20 years, this retro-screening of “Masters of the Universe” managed to again conciliate me with the movie. I’m not sure if it really has “the power”, but if you manage to just go with it, it can be quite entertaining even today. This entry was posted in /slash, movie reviews and tagged /slash, /slash 2015, Billy Barty, Chelsea Field, Courteney Cox, Dolph Lundgren, fantasy, Frank Langella, Gary Goddard, He-Man, James Tolkan, Jon Cypher, Masters of the Universe, Meg Foster, Robert Duncan McNeill, science fiction. Bookmark the permalink.